We are pleased to present Dwight Walker with his 2 Million Miles Milestone Award. 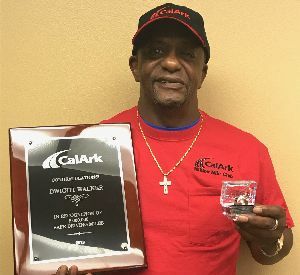 Dwight has driven professionally for 16 years, 14 of them with CalArk. He is from Pine Bluff, AR and is on Michelle Finn’s board. Deronda Wofford, VP of Operations, says Dwight will do anything you ask him to do. Leslie Stout, Director of Safety, adds that ​Dwight does his best and works hard to be compliant and to do the right thing. Over the years, Dwight has received several Safety Awards, 100% On Time Delivery Awards, his 5 Year Service Award, and a 10 Year Service Award.